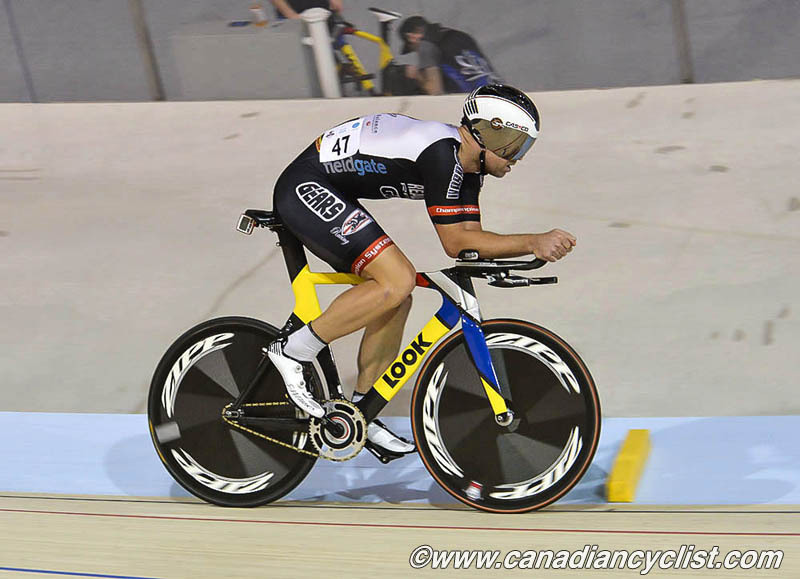 Ed Veal, a 38-year-old Canadian National Cycling Team member, announced Wednesday his attempt to set a new world record - the 'Best Hour Performance' in the Masters Men's 35-39 group, as well as the new outright Canadian Hour Record - on April 10th at 4:45 p.m at the new Mattamy National Cycling Centre in Milton, Ontario. Veal describes the effort as a hard man event. "It's scary to a lot of people, scary to myself," he says. "You've got to be a little bit crazy, it is going to be very painful"
The decision to attempt the feat comes after a year of personal and team victories for Veal, who broke two Canadian records (4,000-metre Team Pursuit and Individual Pursuit) in September 2014. Veal took up cycling late, at age 26, starting with mountain biking and then making the switch to road. "The late start has never held me back," he says. The current Canadian Hour Record of 45.794 km, held by Jacques Naubert, was set in February 1986 at the Montreal Olympic Velodrome. The standing Best Hour Performance in the Master Men's 35-39 age division is held by Australian, Jayson Austin, who set the record distance of 48.315km in one hour at the Dunc Gray Velodrome in Sydney Australia in 2009. The Best Hour Performance is one of the most fabled and prestigious records in the sport of cycling, with nearly all of the sport's icons - from the first director of the Tour de France, Henri Desgrange to all-time cycling greats Fausto Coppi, Jacques Anquetil, Eddy Merckx, Francesco Moser and Miguel Indurain - having held the Elite All-Time Hour Record. There have been a recent series of attempts at the Elite Best Hour Performance, starting with Jens Voigt, who set a new Elite Record of 51.110km in September 2014. The current Elite Record of 52.491km is now held by Australian Rohan Dennis, who made his attempt at the Velodrome at Grenchen Switzerland on February 8, 2015. "It's all about pacing. I'm going to be following a pace and schedule I think I can follow," says Veal. "It will be a testament to my will. I hope people will come out, support my effort and feel my will as I push through to the end." A group of committed companies and individuals have stepped up to support the historic attempt. Paul DeVries and Dave Ellis of Powerwatts have taken on title sponsorship, additionally supported by Norbert Frischkorn of FrischkornMEDIACO, Rob Keilty of Hub HKMB Insurance, Som Seif of Purpose Investments, Howard Chang of Top Drawer Creative Inc. and John Ruffolo of OMERS Ventures stepping up to help. This supportive team of cycling enthusiasts are members Les Domestiques Cycling Club, whose members were the primary private funders of the just-opened Mattamy National Cycling Centre. The 250-metre indoor velodrome is the premiere track cycling facility in North America, host to this summer's Pan Am Games. 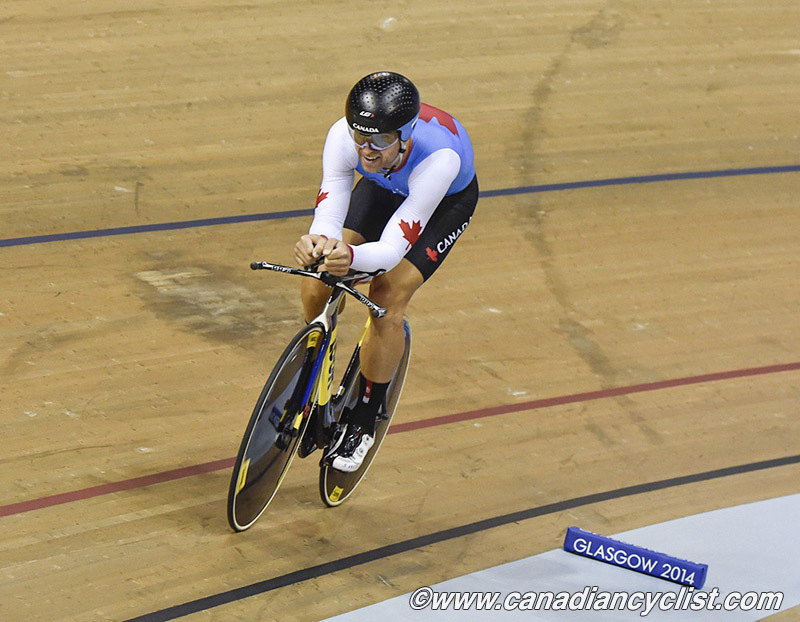 It is one of only two international standard velodromes in Canada and the United States. The fundraising efforts support Veal's goal to become a full-time athlete for the first time in his life. "I want to be all in. I can get myself into good form, but at 38 years of age, injury or illness can change things in a flash," he says. "The support will not only propel this important attempt, but it also fuels my goal of competing in the upcoming Pan Am Games this summer, and ultimately, at the 2016 Rio Olympics." You can follow Ed Veal on Twitter at @RealDealVeal, or via the hashtag #edshour as he prepares for the historic attempt, and most importantly, support his fundraising efforts through his Indiegogo campaign, which kicked off on Wednesday.